The thing about the South Esk is that it is not quite a spate river, but is nevertheless hugely affected by precipitation, whether that is melting snow stored in the corries of the hills of Glen Clova, or just rainfall. Mid April is perhaps a bit early for all but a few small snow drifts to have melted, but that is explainable by the unseasonal warmth we had last week, and of course the lack of rainfall. Because the River has no loch to act as a reservoir, and because it is a small river of only 50 miles in length, it tends to react quickly to dry weather. That is the situation now, and in these conditions any angler will tell you that the chances of persuading a salmon to take a fly diminish rapidly. 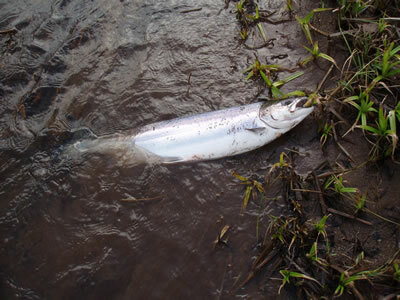 However, a feature of 2011 at Finavon has been sightings of fresh salmon from early March. This is something that did not happen in previous decades because in those days the dams at Kintrockat and Kinnaird were temperature barriers, in the latter case impeding migration massively, and in the former simply slowing the fish down. I remember back in the 1970s that fresh salmon could be caught in the Red Brae Pool at Kintrockat in early March. So, even before improvements had been done to Kinnaird (height two and a half metres) by the civil engineer Colin Carnie (see photo below) the occasional salmon did get through into the middle river. This year there have been many such fish and, as I write this blog on the 13th of April, and having just returned home after a walk along the banks of the Finavon Castle Water, I can say with complete confidence that there are at this very moment at least 50 fresh spring salmon in Finavon’s pools. Quite a lot have already gone through to Inshewan and the beats above, and we have caught and returned 14 at Finavon. Yesterday Moray Macfarlane caught a 7lbs salmon in the Tollmuir Pool in bright sunshine and others were seen in the same pool and in Marcus House Pool below. Good fishing at Inshewan and the first sea trout of 2011 seen (& one lost) Colin Gibb at Inshewan reported 10 fish caught on his beats and lots of fish showing in the Castle Hill with new fish arriving all the time. He also said that many salmon have gone through into the upper river, and that sea trout have been seen in Inshewan’s Garden Pool. It is therefore quite a surprise that Cortachy and Downie Park are only reporting one salmon to date. Their time will certainly come, but it is odd that with a run of spring salmon “as good as we have seen since the 1960s” (Colin Gibb’s opinion) more salmon have not been caught in the superb pools above Inshewan. With the best fish of 16lbs and fish flashing in the usual places at Inshewan, I expect the catch there to increase as soon as we get some fresh water. With the tides being rather dull in the last few days and starting to build up to springs we should see an influx of fresh salmon in the last two weeks before the Usan nets start operating on the 1st of May. What I can say is that every night there is a flurry of activity as new fish pass through Finavon’s pools on their journey upriver. These salmon are invariably sea liced and in a hurry to get upstream. Some linger at Finavon, but the numbers of fish that do so will diminish as the water temperature rises. If we get water, the next fortnight should produce fish in reasonable numbers. If rain doesn’t come, no matter how many rods fish the pools, only the occasional fish will be caught, although I am in no doubt that many will be seen. Yesterday (Wednesday 6th April) there were high winds all over Scotland and, with temperatures hitting 18C in the eastern glens, the last ‘glaciers’ in the high corries continued to melt. These conditions kept water levels high, but the water temperature remained fairly low. 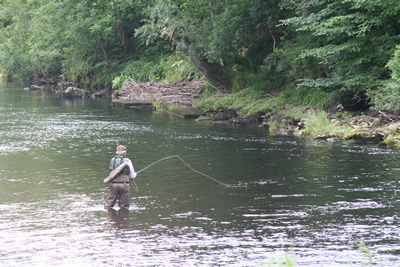 We had a good team of rods, who concentrated on the pools downstream of Red Brae. Apart from the odd pull and the occasional flash of silver from a running fish there was little action. Further up the river on Milton Beat conditions, thanks to a powerful Force 8 gusting 9 gale, were exciting – to say the least – for fishing the fly, but with the SW wind behind me I sort-of fished the whole of the Boat pool, including Willows and the head of the Flats. It was too high for Tyndals, even if one could have got across to fish it. After fishing the most likely lies with a fly (2″ Willie Gunn) I gave up the struggle against the howling gale and resorted to a 2.5″ Rapala. I immediately hooked a 12lbs fresh fish (no sealice) at the Willows which took a good 30 metres of line off the reel before stopping somewhere in the deepest section of the Boat Pool. Another beautiful spring salmon in excellent condition, duly returned. The forecast is for brighter & warmer weather over the next few days which should provide good conditions for fishing the fly. We can even start thinking about fishing the fly higher up in the water column with smaller flies as the temperature rises. Over the weekend the level dropped and the water cleared. But it was cold and windy, with the surface of the quieter pools, such as Boat Pool and Willows, ruffled by the wind. 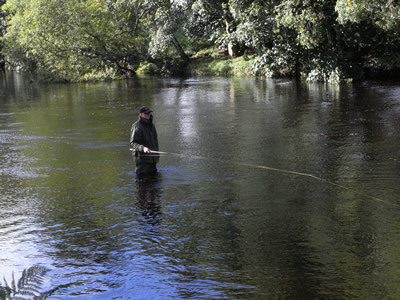 During the morning not much happened despite the efforts of our local team of three rods covering all the major pools. During the afternoon the sun came out and the air temperature rose appreciably. 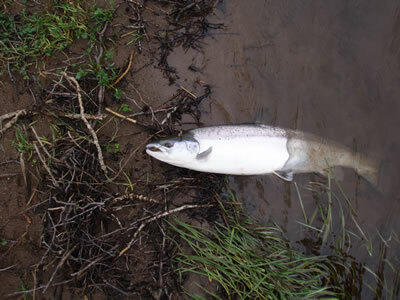 Fish were seen, both kelts and fresh fish, including a big one in Tollmuir Pool. Then in mid afternoon Derek had a beauty from the very tail of Indies Pool: a 2SW fish in prime condition, indicating that wherever it had been feeding at sea had a plentiful supply of prey species, probably somewhere in the western Atlantic Ocean, west of the Irminger Sea. Then, late in the afternoon, Derek Strachan had another fish, this time a 10lbs one from Pheasantry. We don’t think of this pool as a place to catch a spring salmon. 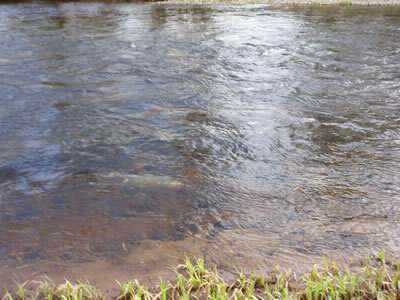 Although it is a beautiful streamy pool, ideal for a sea trout at dusk or a grilse at dawn, we have (it seems wrongly) assumed that it lacks depth to hold fish in the lower water temperatures of March and April. I suspect the pool has been scoured and, as Bill Currie might have said, there are lots of “pots, scallops and scrapes” where the fish can lie untroubled by the force of the flow. So, what started as a rather bleak early April day, ended with two more fish on the books, bringing the FCW total to date to 12. Here is another picture of the Pheasantry fish during the process of bringing it to the net. Postscript. I walked down Milton Beat at dawn today and noted that the river had risen during the night. There is possibly some residual snow in the high corries. For Finavon this is an ideal scenario, with cold and clean water pouring off the hill to bring the fish into the river, but not too quickly, so they pause in the ‘plateaus’ between the streams of FCW. I hope to record more fish later today because the conditions are excellent. Sadly I will not be fishing myself, but I wish our local team ‘tight lines’.